The recipe starts with potatoes sliced into thin wedges. We love a heartier, thicker wedge “fry.” But if you’re into thinner fries, cut into more of a classic shape. 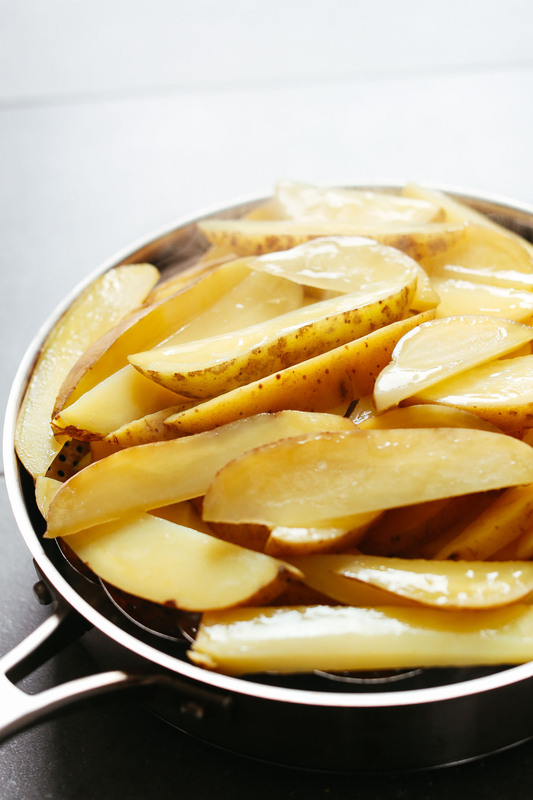 To get the inside tender and not burn the exterior, start by steaming your potatoes. We adapted this method from our Oil-Free Roasted Vegetables recipe! It works like a charm and partially cooks the potatoes to not only speed the cooking time, but also ensure the insides are fluffy and tender. Next, it’s time for spices! For big cheesy flavor, we went with nutritional yeast and sea salt. And for a little heat, we opted for chili powder. After a short bake in the oven, you’re good to go! These potatoes would make the perfect side or snack, especially on game days or if you’re in need of some serious carbs! They’re delicious on their own, but they also pair well with dips like Ketchup, Garlicky Guacamole, or even Jalapeño Vegan Queso! 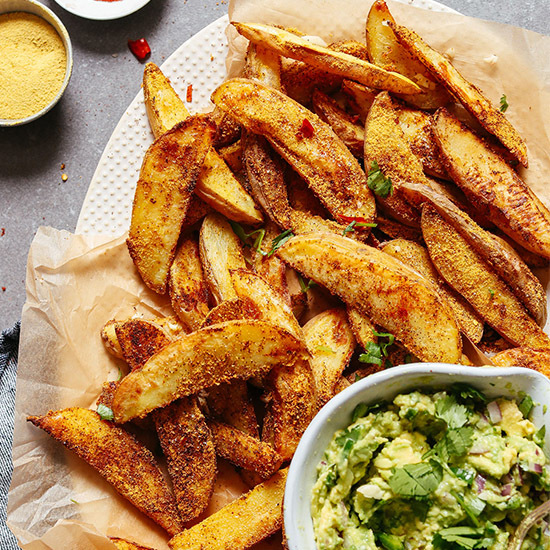 These “wedge” style fries are perfect for dipping. But if you’re looking for “skinny” fries, check out our Garlicky Matchstick Fries! Also delicious. 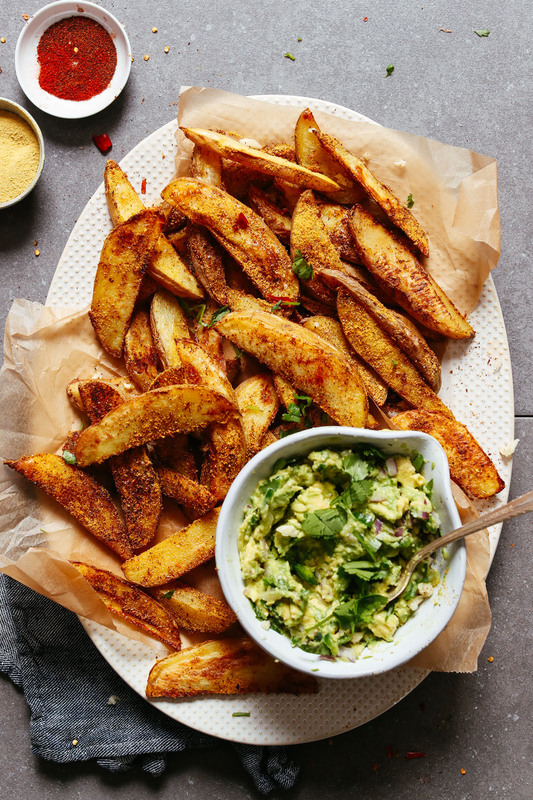 Crispy, cheesy, spicy baked potato fries that are oil-free! Just 5 ingredients and simple methods required. 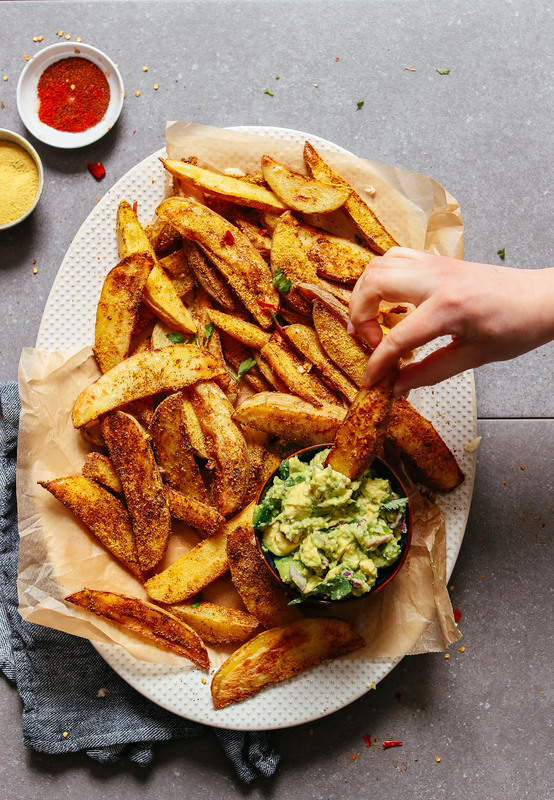 The perfect plant-based side or snack! Preheat oven to 425 degrees F (218 C) and line two (or more as needed) baking sheets with parchment paper. Slice potatoes into small wedges about 1/4- to 1/2-inch wide. Place in a steamer basket or large colander set over a pot of boiling water. Cover and then steam approximately 5 minutes until slightly tender but not cooked. 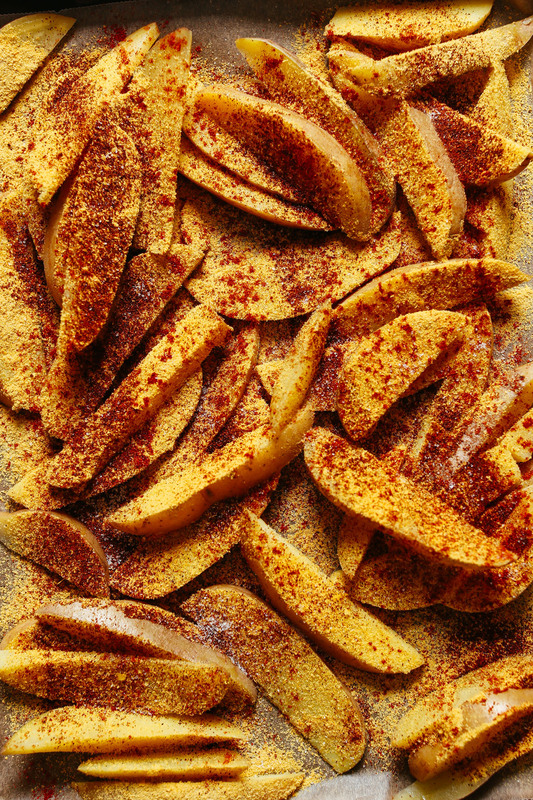 Transfer to baking sheets and top with nutritional yeast, chili powder, garlic powder, sea salt, cayenne pepper (optional), and any other desired seasonings (see photo). Toss gently to coat. Arrange in an even layer on baking sheet, trying not to overlap, so that fries can get crispy. The more room they have, the crispier they will become. Use two baking sheets if needed. Bake for 15 minutes. Then remove from oven and increase heat to 450 degrees F (232 C). Flip to ensure even baking on both sides and bake for an additional 10-15 minutes or until crispy and golden brown. Serve hot! They're delicious as is, but they're elevated tossed in fresh herbs and garlic (optional) and served with ketchup or guacamole. Best fresh. Store leftovers covered in the refrigerator up to 4 days. Reheat in a 375-degree F (190 C) oven until hot. *Nutrition information is a rough estimate based on 1 serving calculated without optional ingredients. This is the only way I will make oven fries from now on! Was very skeptical about no oil fries but they were perfect and delicious. Topped them with chili and vegan cheese sauce and scallions. Delicious!! My family all loved them- thank you!! These were amazing! I’ve been trying to eat minimal oil and was so surprised by how crispy and delicious these were. The seasoning was perfect. This will definitely be one of my staples! This was so delicious, made it not too long ago and eating it as I am writing this comment. Thank you for such awesomeness. Taste cheesy and it’s healthy. The seasoning got a bit TOO crisp with 30 minutes in the oven, I’ll try 25 minutes next time. Also a note that these don’t reheat very well (as with most fries). Plan to adjust the portion accordingly to make sure you can get these while they’re fresh. I was skeptical…but these are the BEST and CRISPIEST fries I have ever made. In love! Love these! I’ve made them probably over 5 times and I steam the wedges till they are fork tender and then bake in the oven and they are delicious chewy in the inside and crispy on the outside! 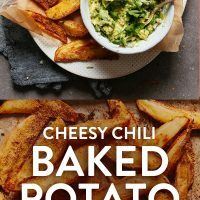 I used to always have almost uncooked potato on the inside and burnt edges happening and this recipe is perfection! My 2 year old son loves them too, so thats a win! Going to try this technique with sweet potatoes tonight! Yum! Glad to hear you’re loving this recipe, Justine! I made these tonight to go with some vegan chili. I only put salt and garlic powder on and they turned out great! They weren’t as crisp as normal french fries but I actually enjoy the softer texture that you get from the blanching. I’ll definitely make again! Made both the Guacamole and the fries, both were so good!! I added some smoked paprika to the fries also and I can’t believe it took me this long to make the recipe!! Beautiful chips, nice and crispy, great flavor. Definitely a go to for great fries every time. Amazing – so simple, yet soooooo delicious? I have added some onion powder to spice/yeast mix, and served those crispy cuties straight from the oven with homemade vegan aioli…I almost cried eating the last wedge! Great additions to the recipe! Glad you enjoyed! Haven’t tried the dip, yet, but reading the ingredients I’m sure it’s splendid. I made these exactly as written and they turned out delicious! We had them along side the Quinoa Vegetable Stuffed Portobellos. I really wanted to also make the guac but the store didn’t have ripe avocados :( Next time! Anyway, 5 stars! Thank you for creating an oil free recipe!! Please please keep the oil free recipe’s coming!! Made for dinner tonight with burgers. I make no oil-baked fries a lot and they’ve never been this good. Crispy on the outside, soft on the inside, and great spice blend. Two thumbs up from the whole family: 8 yr old, 10 yr old, hubby, and me! Thank you! I make sweet potato fries all the time in the oven, but have never tried this oil-free method. They turned out PERFECTLY! I was surprised that they even puffed up like “actual” fried fries! Thanks for the recipe! Woot woot! Glad you enjoyed, Bailey! I have never made my own fries without using any oil. I was worried they would be really dry, but they turned out great! Instead of steaming the sliced potatoes for 5 minutes, I microwaved them for 3 minutes. Glad you enjoyed them, Callie! I made this last evening and it was so delicious! Everyone in my family gobbled it up and nobody even knew that it was oil-free, they were too busy licking their fingers! Thank so so so much for another wonderful, healthy oil-free recipe! Please keep making more delicious and tasty oil free vegan recipes! These turned out great, crispy on the outside and fluffy on the inside! I didn’t have nutritional yeast and used smoked paprika instead of cayenne pepper. They were the perfect side to some crispy chickpeas and kale with a tahini dressing. I scoffed the lot before I remembered to take a picture! I tried these tonight, and they were crispy, but there was absolutely no flavor on the inside. The skin was covered in spices, but when I bit into it, it tasted like pure bland potato. Any suggestions? I feel like oil let’s the spices “penetrate”. I just made these…I was surprised that they turned out crispy! I used russets and they were very fluffy inside. I patted the pieces to dry them off a little after steaming and then tossed them with the seasoning in a bowl before putting them on the cookie sheet. Please… keep the oil free & vegan recipes coming?? Glad you’re enjoying them, Laura! Your recipes are consistently good; it amazes me! At this point, you are the only cookbook and recipe blog I use in ‘real life’. Just made these potatoes and they are delish. I may try this seasoning blend on everything! So kind! Glad you’re enjoying the recipes, Christina! I agree! I am transitioning to a vegan diet and these recipes are wonderful. My whole family loves them and that’s tough to do with preschoolers! This was absolutely delisicous. I love EVERY recipe on your site. Thank you Dana for your continued delicious creations. Me too! We’d starve if it weren’t for you Dana! Can I make these with sweet potatos? I would think so, yes! Just know that sweet potatoes tend to take slightly less time, so perhaps steam for slightly less time, and bake for slightly less time. Oil free fries are my FAVORITE! I love roasting sweet potatoes, purple potatoes, carrots, butternut squash, and parsnips this way. I wouldn’t say I’ve ever had chili cheese fries before, but I definitely have to try a veganized version of them now. I’d probably modify this and use sweet potatoes or carrots just because I prefer them over regular potatoes. But overall, this looks like the most glorious savory indulgence! I’ve had success with a slightly different approach to the same idea…I partially “bake” whole potatoes in the microwave. I only bake them for half the time required for a true baked potato. After the potatoes have cooled slightly, I cut them into 6 large sections (lengthwise) and then season and bake them in a hot oven for about 30 minutes. They are like steak fries and delicious as a meal in themselves. I fear the instant pot would make them too soft. You’d really have to watch. We don’t have / use one, so I’m not sure! Let us know if you try it out. I made these for brunch yesterday morning and they were fantastic! I made guacamole with them as well and it was splendid. Thanks for another awesome recipe! Hi….sounds yummy! Think this recipe would work for sweet ‘taters too? Hi, Dana! Thanks so much for doing more oil-free recipes! I tried it wth just added salt before it goes into the oven & a sprinkling of plain white vinegar after it comes out. Tastes delicious. 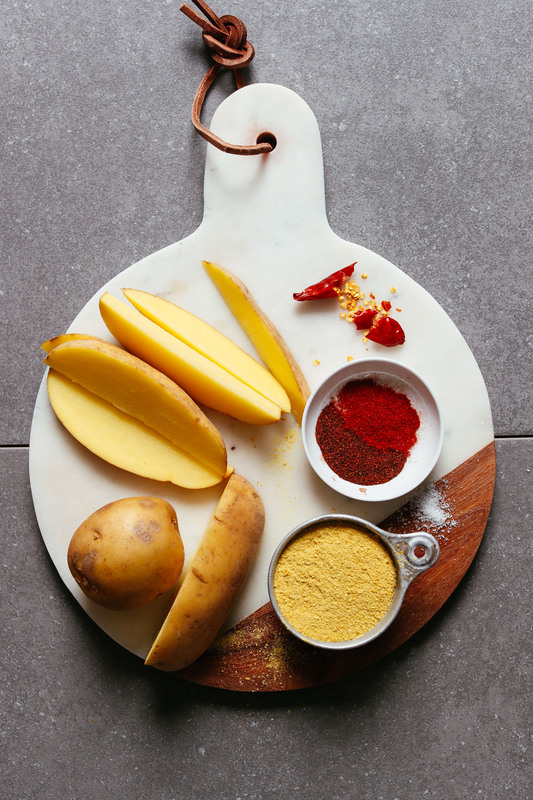 This is my go-to method for making oven-baked fries – works every time! Never tried it with nutritional yeast though (I usually add spices and chickpea flour), sounds great. Why chickpea flour? Does it form sort of a crust on it or something? Just curious! Thanks! What is the cheesey part? I might have missed it. Nutritional yeast is supposed to be used for a cheesy flavor, so I believe that is the cheesy part.